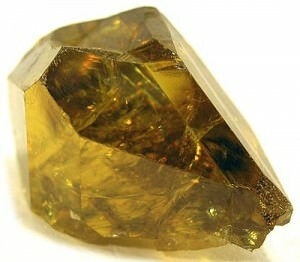 Sphene gemstones (officially known as titanite) are known for their high dispersion (often called fire), which is even higher than that of diamonds. This fire is clearly visible in the video at the bottom of this page. It shows that sphene or titanite is an amazing gemstone that should not be missing from your mineral or gemstone collection. Unfortunately sphene is not as suitable for jewelry as some other gemstones, but it can certainly be worn in a necklace, pendant or a pair of earrings if you take good care of it. What is Sphene or Titanite? Officially this mineral is named titanite, after the presence of titanium in it. However when used as a gemstone it is usually referred to as sphene. 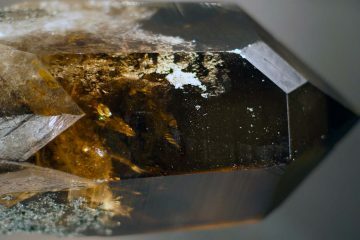 The name is derived from the Greek word ‘sphenos’ which means wedge, sphene crystals are usually formed in a wedge shape. It can be found in a range of colors, usually they are red, yellow or green, though brown and grey are possible as well. Owing to their high dispersion the fire of sphene stones even in rough form can be quite high. When cut the play of color becomes even more apparent, easily surpassing that of almost all gemstones including diamonds. Sphene can be found in a number of locations all over the world including Madagascar, India, Germany, Russia, The USA and Brazil. Recent discoveries in Brazil and Madagascar especially have made sphene gemstones more available than ever before, though sphene is still largely unknown to the general public. 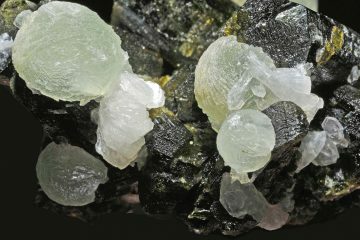 Capelinha sphene is named after a municipality in Brazil where high quality deposits of sphene have been found. Sphene has a hardness of 5 to 5.5 on Mohs hardness scale and is fairly brittle. This makes it not as suitable for use in gemstone jewelry as most of the better known gemstones like tanzanite or moissanite. If you simply must own one of these gemstones, and I can’t blame you, be sure to buy a sphene pendant, necklace or earrings. Sphene should be cared for properly because it is fairly soft and brittle. The tips below will help you provide that care. Physical labor should be avoided when wearing sphene jewelry. Though not very likely to chip or shatter tiny scratches will eventually dull the stone making it necessary to get it repolished. Cleaning is best done by hand, lukewarm water and a mild soap should usually be enough. A soft brush can be used if more cleaning power is needed. Dry it with a soft cloth and air it for a few minutes before you store or wear it. Jewelry steam cleaners and ultrasonic jewelry cleaners should not be used because sphene is slightly sensitive to heat and chemicals. The ultrasonic waves could damage the gemstone as well, because it is fairly brittle. Sphene should be stored in a separate compartment, as it can be scratched by most faceted gemstones. Because certain chemicals in makeup, deodorant and perfumes can react with sphene you should only put your jewelry on when you are ready to head out the door. 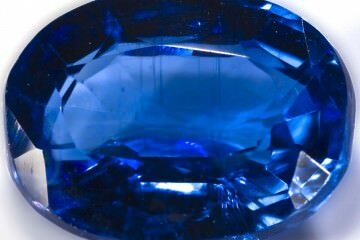 The reactions are not extreme, but they certainly can dull a gemstone over time. An overview of what you should be aware of before you buy sphene gemstones or jewelry. It is fairly easy to buy a natural sphene gemstone as there is no synthetic sphene being produced. There are simulants or imitations on the market, such as colored cubic zirconia or quartz. Though these do not have the dispersion of real sphene and are usually fairly easy to spot. Gemstone treatments are uncommon as well, though some are heated to produce a red or orange color. The issues with simulants and treatments make it advisable to only shop at stores with a high reputation that are known for fully disclosing any treatments. Color is very important for sphene. Most valued is a green color though greenish yellow to orange are not that far behind. 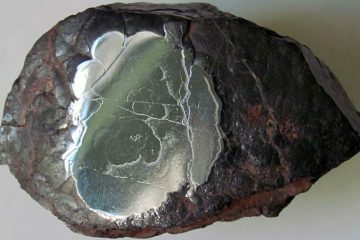 Most important is its dispersion or the play of colors that is visible in high quality sphene. Clarity is important as well, inclusions have a very negative effect on dispersion. The focus should not be on size as most higher carat stones are at the least slightly included making them look dull. It’s best to purchase sphene that is at least eye-clean. Cut: the most popular cut for sphene is the round brilliant cut. This cut maximizes the dispersion which is the most important property for a sphene. Other shapes, such as ovals and emerald cuts, are available but not in large numbers. The cut quality should be at least good, though excellent or better is preferred. Price per carat increases when dealing with larger sphenes, because most of the crystals found are below 2 carats when cut. 30+ stones have been found but these are very rare, especially when they have a high clarity. Good quality sphene sells for around $60-$80 per carat. With green sphene being a bit more expensive than that and yellowish green to yellow and orange towards the lower end of the range. Smaller sized sphene, around one carat, can be cheaper than that though keep in mind that the dispersion or play of light is not as clearly visible in these. Large specimens can sell for a lot more than that, $300+ per carat is no exception. Where Can I Buy Sphene? It is unlikely that you will find them in regular jewelry stores. Your best chance would be to look for them at a specialized colored gemstones dealer. Be sure to call ahead because many do not keep a large selection of every gemstone on hand. Shopping online is an option as well, though Amazon only has a few pieces. Ebay has over 1500 sphene gemstones, though just a few dozen pieces of preset jewelry. On top of that they are nearly all rings. Sphene rings unfortunately are quite easy to damage in everyday use so I would advise against buying them. Unless they are set in a protective setting and you don’t intend to wear it regularly. Before buying anything on Ebay you should read our article on why you should stay away from Ebay unless you are an experienced buyer. Like every auction site Ebay has problems with an increasing amount of dishonest sellers and it’s better to be safe than sorry. This means that it’s likely that you’ll need to get a loose gemstone set in a piece of jewelry yourself. Fortunately there are many benefits to getting your own jewelry made, beyond the obvious benefit of getting exactly what you want. Find out what those advantages are in this article on loose gemstones. Here’s a video of a 7.46 carat greenish-yellow emerald cut sphene gemstone from Madagascar, cut by Steve Moriarty. The high dispersion is clearly visible even in this shape, which is not ideal for showing this property.